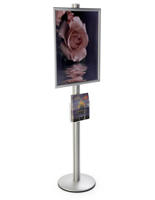 This poster frame stand presents your advertisement elegantly! 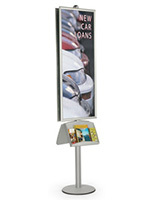 Eight foot tall display stand with a large 22" x 56" front loading snap frame and a metal literature tray. 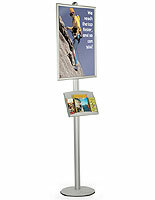 This poster frame stand, also known as a sign holder, promotes events and products. 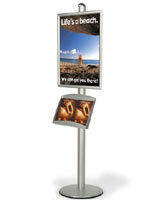 This poster frame stand advertises your message with take away leaflets or flyers at the ready! 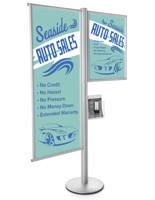 Use this eye catching display stand most effectively at large, open indoor venues with lots of pedestrian traffic. 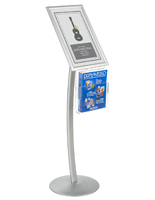 The poster frame stand shown here is best suited for large halls, entryways, hotel and business lobby areas, large retail stores and shopping malls. The snap frame is easy to operate. Simply lift up the frame sides, place the graphics below the clear lens and close all four sides. 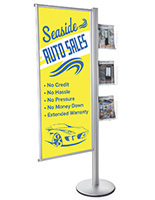 The non-glare, clear PVC plastic lens is provided to protect your sign media. The literature tray is made of powder coated steel for durability and holds any 8-1/2"w x 11"h print materials side by side. Installation or height adjustment of the poster frame or metal tray is simply performed using the screws on the connector plates behind the frame and metal tray, with easy instructions provided. This poster frame stand is a versatile and space saving advertising display, a great value for universities, retailers, exhibition halls and lobbies. Note: When the poster frame and metal tray are at their highest adjustment, the height of the bottom of the metal tray is 24" above the floor. 18.0" x 13.0" x 1.8"